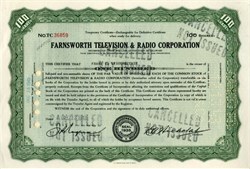 Beautiful RARE stock certificate from the Farnsworth Television & Radio Corporation Company printed in 1943. This historic document was printed by the E.A. Wright Bank Note Company and has an ornate border around it with company header and seal. This item has the signatures of the Company’s President, and Treasurer, and is over 74 years old. Stamped Cancelled not Issued. Philo Taylor Farnsworth (August 19, 1906 – March 11, 1971) was an American inventor and television pioneer. Although he made many contributions that were crucial to the early development of all-electronic television, he is perhaps best known for inventing the first fully functional all-electronic image pickup device (video camera tube), the "image dissector", the first fully functional and complete all-electronic television system, and for being the first person to demonstrate such a system to the public. In later life, Farnsworth invented a small nuclear fusion device, the Farnsworth–Hirsch fusor, or simply "fusor", employing inertial electrostatic confinement (IEC). Although not a practical device for generating nuclear energy, the fusor serves as a viable source of neutrons. The design of this device has been the acknowledged inspiration for other fusion approaches including the Polywell reactor concept in terms of a general approach to fusion design. Farnsworth was born on August 19, 1906, to Lewis Edwin Farnsworth and Serena Amanda Bastian, a Mormon couple then living in a log cabin built by Lewis's father in a place called Indian Creek near Beaver, Utah. The family moved to a farm in Rigby, Idaho, in 1918, where Lewis supplemented his farming income by hauling freight with his horse-drawn wagon. Philo was excited to find his new home was wired for electricity, with a Delco generator providing power for lighting and farm machinery. He was a quick study in mechanical and electrical technology, repairing the troublesome generator, and upon finding a burned out electric motor among some items discarded by the previous tenants, proceeding to rewind the armature and convert his mother's hand-powered washing machine into an electric-powered one. Philo developed an early interest in electronics after his first telephone conversation with an out-of-state relative and the discovery of a large cache of technology magazines in the attic of the family’s new home. Farnsworth excelled in chemistry and physics at Rigby High School, and produced sketches and prototypes of electron tubes. One of the drawings he did on a blackboard for his chemistry teacher, Justin Tolman, was recalled and reproduced for a patent interference case between Farnsworth and Radio Corporation of America (RCA). Philo took violin lessons from Reuben Wilkins in Ucon, Idaho. Farnsworth asked his high school science teacher for advice about an electronic television system he was contemplating. He provided the teacher with diagrams covering several blackboards to show how it might be accomplished electronically. He asked his teacher if he should go ahead with his ideas. The science teacher encouraged him to do so. In the fall of 1922 the Farnsworths moved to Provo, Utah. But Philo stayed behind to work for the railroad in Glenns Ferry, Idaho, saving enough money to begin classes at Brigham Young University (BYU) when he rejoined his family in the fall of 1923. The family had moved into the first floor of a large two-story house, renting the top floor to BYU students. In early January of the following year, Lewis Farnsworth died of pneumonia, leaving sixteen-year-old Philo to care for his mother, two sisters and two brothers. He applied to the United States Naval Academy in Annapolis, Maryland, where he was recruited with a second-highest in the nation score of the year he entered in 1924. However, he was already thinking ahead to his television projects and, upon learning the government would own his patents if he stayed in the military, he sought and received an honorable discharge, returning to Utah to continue to help support his mother. Philo worked while his sister Agnes, the older of the two, took charge of the family home and the second-floor boarding house (with the help of a cousin then living with the family). The Farnsworths later moved into half of a duplex, with family friends the Gardners moving into the other side when it became vacant. Philo developed a close friendship with Cliff Gardner, who shared Farnsworth's interest in electronics. The two moved to Salt Lake City to start a radio repair business. The business failed and Gardner returned to Provo. But Farnsworth remained in Salt Lake City, and through enrollment in a University of Utah job-placement service became acquainted with Leslie Gorrell and George Everson, a pair of San Francisco philanthropists who were then conducting a Salt Lake City Community Chest fundraising campaign. They agreed to fund Farnsworth's early television research, and set up a laboratory in Los Angeles for Farnsworth to carry out his experiments. Before relocating to California, Farnsworth married Gardner's sister, Elma “Pem” Gardner Farnsworth (February 25, 1908 – April 27, 2006), and the two traveled to the West Coast in a Pullman coach. Farnsworth in the National Statuary Hall Collection A few months after arriving in California, Farnsworth was prepared to show his models and drawings to a patent attorney who was nationally recognized as an authority on electrophysics. Everson and Gorrell agreed that Farnsworth should apply for patents for his designs, a decision which proved crucial in later disputes with RCA. Most television systems in use at the time used image scanning devices ("rasterizers") employing rotating "Nipkow disks" comprising lenses arranged in spiral patterns such that they swept across an image in a succession of short arcs while focusing the light they captured on photosensitive elements, thus producing a varying electrical signal corresponding to the variations in light intensity. Farnsworth recognized the limitations of the mechanical systems, and that an all-electronic scanning system could produce a superior image for transmission to a receiving device. On September 7, 1927, Farnsworth's image dissector camera tube transmitted its first image, a simple straight line, at his laboratory at 202 Green Street in San Francisco. The source of the image was a glass slide, backlit by an arc lamp. An extremely bright source was required because of the low light sensitivity of the design. By 1928, Farnsworth had developed the system sufficiently to hold a demonstration for the press. His backers had demanded to know when they would see dollars from the invention, so the first image shown was, appropriately, a dollar sign. In 1929, the design was further improved by elimination of a motor-generator, so the television system now had no mechanical parts. That year, Farnsworth transmitted the first live human images using his television system, including a three and a half-inch image of his wife Elma ("Pem"), with her eyes closed because of the blinding light required. Many inventors had built electromechanical television systems prior to Farnsworth's seminal contribution, but Farnsworth designed and built the world's first working all-electronic television system, employing electronic scanning in both the pickup and display devices. He first demonstrated his system to the press on September 3, 1928, and to the public at the Franklin Institute in Philadelphia on August 25, 1934. In 1930, Vladimir Zworykin, who had been developing his own all-electronic television system at Westinghouse in Pittsburgh since 1923, but which he had never been able to make work or satisfactorily demonstrate to his superiors, was recruited by RCA to lead its television development department. Before leaving his old employer, Zworykin visited Farnsworth's laboratory and was sufficiently impressed with the performance of the Image Dissector that he reportedly had his team at Westinghouse make several copies of the device for experimentation. But Zworykin later abandoned research on the Image Dissector, which at the time required extremely bright illumination of its subjects to be effective, and turned his attention to what would become the Iconoscope. In 1931, David Sarnoff of RCA offered to buy Farnsworth's patents for $100,000 (USD), with the stipulation that he become an employee of RCA, but Farnsworth refused. In June of that year, Farnsworth joined the Philco company and moved to Philadelphia along with his wife and two children. RCA would later file an interference suit against Farnsworth, claiming Zworykin's 1923 patent had priority over Farnsworth's design, despite the fact it could present no evidence that Zworykin had actually produced a functioning transmitter tube before 1931. Farnsworth had lost two interference claims to Zworykin in 1928, but this time he prevailed and the U.S. Patent Office rendered a decision in 1934 awarding priority of the invention of the image dissector to Farnsworth. RCA lost a subsequent appeal, but litigation over a variety of issues continued for several years with Sarnoff finally agreeing to pay Farnsworth royalties. Zworykin received a patent in 1928 for a color transmission version of his 1923 patent application, he also divided his original application in 1931, receiving a patent in 1935, while a second one was eventually issued in 1938 by the Court of Appeals on a non-Farnsworth related interference case, and over the objection of the Patent Office. In 1932, while in England to raise money for his legal battles with RCA, Farnsworth met with John Logie Baird, a Scottish inventor who had given the world first public demonstration of a working television system in London in 1926, using mechanical imaging systems, and who was seeking to develop electronic television receivers. Baird demonstrated his mechanical system for Farnsworth, and explained "the superiority of his system". But after watching several minutes of Farnsworth's version, "He advanced slowly, as if hypnotized, until he was standing directly before it, He stood there for some time; he turned without a word and left" Baird's company directors pursued a merger with Farnsworth, paying $50,000 to supply electronic television equipment and provide access to Farnsworth patents. Baird and Farnsworth competed with EMI for the U.K. standard television system, but EMI merged with the Marconi Company in 1934, gaining access to the RCA Iconoscope patents. After trials of both systems, the BBC committee chose the Marconi-EMI system, which was by then virtually identical to RCA's system. The image dissector scanned well, but had poor light sensitivity compared to the Marconi-EMI Iconoscopes, dubbed "Emitrons". After sailing to Europe in 1934, Farnsworth secured an agreement with Goerz-Bosch-Fernseh in Germany. Some image dissector cameras were used to broadcast the 1936 Olympic Games in Berlin. In March 1932, Philco denied Farnsworth time to travel to Utah to bury his young son Kenny, placing a strain on Farnsworth's marriage, and possibly marking the beginning of his struggle with depression. In May 1933, the Philco Corporation severed their relationship with Farnsworth because, in George Everson's words, "it [had] become apparent that Philo's aim at establishing a broad patent structure through research [was] not identical with the production program of Philco." Many sources paint this breakup as Philco's idea, but Everson made it sound as though the decision was mutual and amicable. Farnsworth returned to his lab, and by 1936 his company was regularly transmitting entertainment programs on an experimental basis. That same year, while working with University of Pennsylvania biologists, Farnsworth developed a process to sterilize milk using radio waves. He also invented a fog-penetrating beam for ships and airplanes. In 1936 he attracted the attention of Collier's Weekly, which described his work in glowing terms. "One of those amazing facts of modern life that just don't seem possible – namely, electrically scanned television that seems destined to reach your home next year, was largely given to the world by a nineteen year old boy from Utah ... Today, barely thirty years old he is setting the specialized world of science on its ears." In 1938, Farnsworth established the Farnsworth Television and Radio Corporation in Fort Wayne, Indiana, with E. A. Nicholas as president and himself as director of research. In September 1939, after a more than decade long legal battle, RCA finally conceded to a multi-year licensing agreement concerning Farnsworth's 1927 patent for Television totaling $1 million. RCA was then free, after showcasing electronic television at The New York World's Fair on April 20, 1939, to sell electronic television cameras to the public. Farnsworth Television and Radio Corporation was purchased by International Telephone and Telegraph (ITT) in 1951. During his time at ITT, Farnsworth worked in a basement lab known as “the cave” on Pontiac Street in Fort Wayne. From here he introduced a number of breakthrough concepts, including: a defense early warning signal, submarine detection devices, radar calibration equipment and an infrared telescope. “Philo was a very deep person – tough to engage in conversation because he was always thinking about what he could do next,” said Art Resler, an ITT photographer who documented Farnsworth’s work in pictures. One of Farnsworth's most significant contributions at ITT was the PPI Projector, an enhancement on the iconic "circular sweep" radar display, which allowed safe control of air traffic from the ground. This system developed in the 1950s was the forerunner of today’s air traffic control systems. In July 1957, Farnsworth appeared on the CBS quiz show I've Got A Secret, hosted by Garry Moore. Moore identified Farnsworth as "Dr. X" and his secret ("I invented electronic television") flashed on television screens. The panel failed to guess his secret. Moore then spent a few minutes discussing with Farnsworth his research on such projects as high definition television, flat screen receivers, and fusion power. In the spring of 1967, Farnsworth and his family moved back to Utah to continue his fusion research at Brigham Young University, which presented him with an honorary doctorate. The university also offered him office space and an underground concrete bunker for the project. Realizing the fusion lab was to be dismantled at ITT, Farnsworth invited staff members to accompany him to Salt Lake City, as team members in Philo T. Farnsworth Associates (PTFA). By late 1968, the associates began holding regular business meetings and PTFA was underway. Although a contract with the National Aeronautics and Space Administration (NASA) was promptly secured, and more possibilities were within reach, financing stalled for the $24,000 in monthly expenses required to cover salaries and equipment rental. By Christmas 1970, PTFA had failed to secure the necessary financing, and the Farnsworths had sold all their own ITT stock and cashed in Philo's life insurance policy to maintain organizational stability. The underwriter had failed to provide the financial backing that was to have supported the organization during its critical first year. The banks called in all outstanding loans, repossession notices were placed on anything not previously sold, and the Internal Revenue Service put a lock on the laboratory door until delinquent taxes were paid. In January 1970, PTFA disbanded. Farnsworth had begun abusing alcohol in his later years, and as a consequence he became seriously ill with pneumonia, and died on 11 March 1971. Farnsworth's wife Elma Gardner "Pem" Farnsworth fought for decades after his death to assure his place in history. Farnsworth always gave her equal credit for creating television, saying, "my wife and I started this TV." She died on April 27, 2006, at age 98. The inventor and wife were survived by two sons, Russell (then living in New York), and Kent (then living in Fort Wayne, Indiana). In 1999, TIME magazine included Farnsworth in "The TIME 100: The Most Important People of the Century"'. Philo Taylor Farnsworth 1906–71 - American inventor, b. Beaver, Utah, grad. Brigham Young Univ., 1925. He demonstrated (1927) a working model of a television system. His “dissector tube” (called the orthicon), like V. K. Zworykin’s iconoscope, is a means of dividing an image into particles whose light values, when transmitted, are capable of being restored to form a replica of the original image. In 1938 he became research director of the Farnsworth Television and Radio Corporation. Throughout his lifetime, Farnsworth amassed some 165 patents. In 1930 Farnsworth's first three patents are issued by the U.S. Patent office. #1,773,980, covering his "Television System" includes the indispensable language for transmitting television pictures by wholly electronic means. Patents challenged in litigation by Radio Corporation of America (RCA). In 1935 U.S. Patent Office issues decision in Zworykin-v-Farnsworth Interference #64,027, awarding "priority of invention" of electronic television to Philo T. Farnsworth; Farnsworth testimony includes Justin Tolman, who recalls after-school discussions with his young prodigy and produces a hand-drawn sketch of the Image Dissector. 1938 Farnsworth Television & Radio Corporation formed; operations relocated to Fort Wayne, IN. 1939 After nearly 10 years of litigation, RCA takes a license for use of the Farnsworth patents, the first license ever requiring RCA to pay royalties to an outside inventor. May 1941 "National Emergency" is declared and all commercial radio and television manufacturing is discontinued. Farnsworth retreats to his farm in Maine for the duration of World War II.